In a lot of ways, Superboy is one of DC's best stabs at capturing the kind of wish fulfillment character that Captain Marvel perfected. It's one of the simplest ideas in comics, taking all the powers of Superman and compressing them down into a pint-sized package that also went to school and was secretly way cooler and smarter than any of his classmates who probably didn't even know about the Bottle City of Kandor. You can see the appeal for the audience. But with those awesome powers came situations that could challenge an indestructible teen, drawing out the metaphors of growing up and presenting them as part of the grand soap-opera of superheroism. You know, like that time everyone in Smallville became a robot and Superboy had to kill his best friends and family. We've all been there, right? Okay, so maybe none of us have been there, but that didn't stop Jerry Coleman and John Sikela from dropping that very situation into Adventure Comics #237. At the time, Adventure was an anthology title that featured a Superboy story as the lead, with backups featuring Aquaman and Green Arrow in their watery and/or archery-laden attempts at providing charity to the Old Seaman's Home and trying super hard to be Batman, respectively. Ten months after this issue, though, Adventure would debut a new set of characters that would eventually take over the title, the Legion of Super-Heroes. Finally, the children of the fifties would be freed from the terrible burden of pretending to care about sea-crime every single month. History aside, I mention all this because the way this story plays out is pretty weird for LOSH fans, but we'll get around to that later. For now, our story kicks off with Superboy returning from what Coleman refers to as "an out-of-town mission," and right away we're dealing with something that's not quite up to expectations. I mean, really, if you're not going to provide any details, why limit yourself to "out-of-town?" Send that kid to space, man, it doesn't cost anything extra. 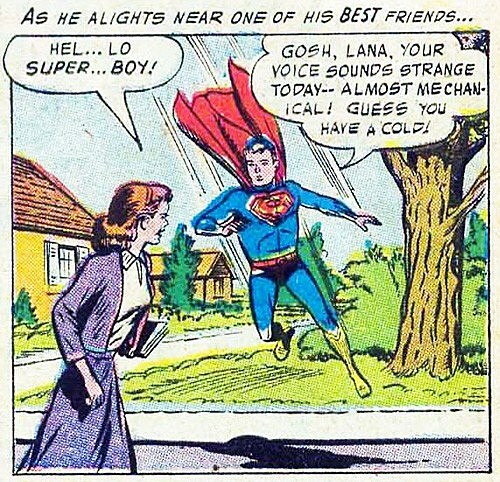 I'm not really one to romanticize the past -- except in the case of old comics about Superboy and his yellow boots, which are objectively pretty rad -- but I do long for a time when people would respond to a slight stutter with "your voice sounds strange -- almost mechanical!" When flu season rolls around this year, I encourage all of you to make subtle insinuations that your friends and coworkers are robots whenever they so much as sniffle. We can make a finer world... together. 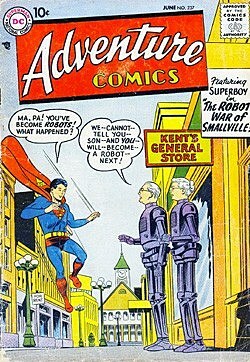 Superboy understandably freaks out and heads home to find that even his own parents are robots, and assumes that this is all some elaborate prank to trick him. If that's the case, though, it's a pretty terrible plan: These robots are walking around buzzing and drinking oil and, in the case of Ma Kent, have chunks of their face hanging off like the Terminator. They're not exactly fooling anybody into thinking they're real people. There's even a robot duplicate of Superboy himself, and what's more, he knows that Superboy is actually -- spoiler warning -- Clark Kent! And what's more, Robosuperboy (Superoboy?) has orders to drive the genuine article out of town by repeatedly punching him. Clearly, something is jacked up beyond all recognition in Smallville. Obviously, Superboy has only one course of action open to him: brutally destroying all robots, starting with his own family and friends. 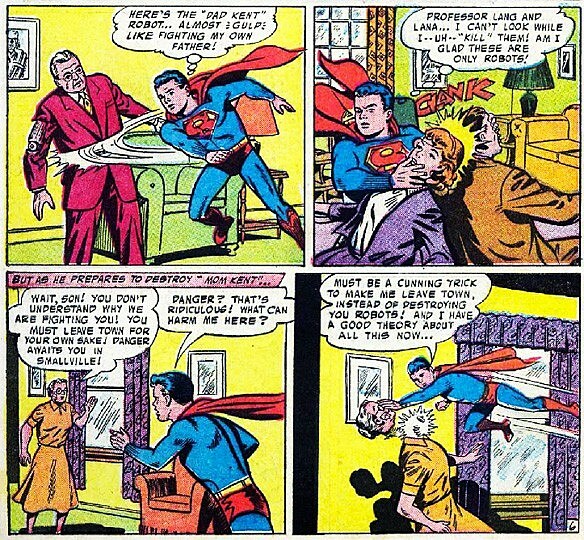 The next time someone tells you that Silver Age comics are nothing but silly nonsense that don't have the "mature" themes of today's books, remind them that there was an issue where Superboy straight karate chopped his dad in half and then ripped his mom's head off with one hand. Actually, now that I'm actually writing it out, this might be the only Silver Age comic that's still in continuity. 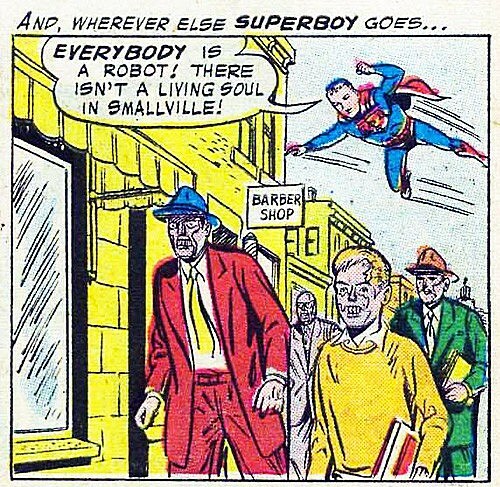 Anyway, the reason that Superboy has gone all Magnus: Robot Fighter (minus the fetching minidress) is that he has leapt to the conclusion that an army of alien robots have decided to invade the Earth, using Smallville as their beachhead. This might seem like a pretty dubious leap of logic, as anyone smart enough to master interplanetary travel and advanced robotics should realize that you don't want to start in the town that has the indestructible teenager running around, but let's be real: In the fifties, this happened on, at the very least, a quarterly basis. It's a safe assumption. But it's actually not what's going on, and Superboy's first clue to the real haps comes when he casually decides to check out the general store with his x-ray vision. Oh, and then Smallville gets nuked from orbit. Superboy flies up, coming to the immediate (and again, completely accurate) realization that it was a bomb aimed at Smallville from -- incoming awesome band name -- "some space enemy." But what was actually destroyed was a dummy town -- "like those dummy towns the Nazis built in World War II!" Of course! The real Smallville is a few miles away, hidden by fog, which as we all know blocks any and all effects of atomic weapons dropped from space. So, just so we're clear on this, the entire premise of this story is that Superboy has no idea where his hometown is actually located. You'd think that's something he would know. Still, the question is left as to just who's responsible for building the fake town, and that's where things get weird. 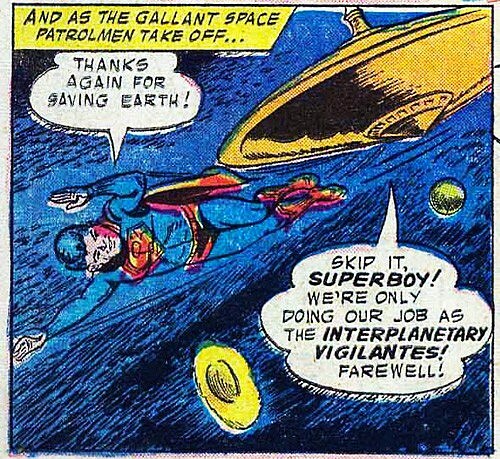 Superboy flies out to space to see who's hanging around in orbit, and runs into The Interplanetary Vigilantes. These dudes are 100% awesome. Not only do they run around the galaxy with transistor radios strapped to their chests for space reasons, they also create the weirdest plans imaginable. Seriously, nobody thought to just tell Superboy that somebody was trying to space-bomb him and then build the fake Smallville? I realize he was on an "out-of-town" mission, but these dudes are from space. They could probably catch up. 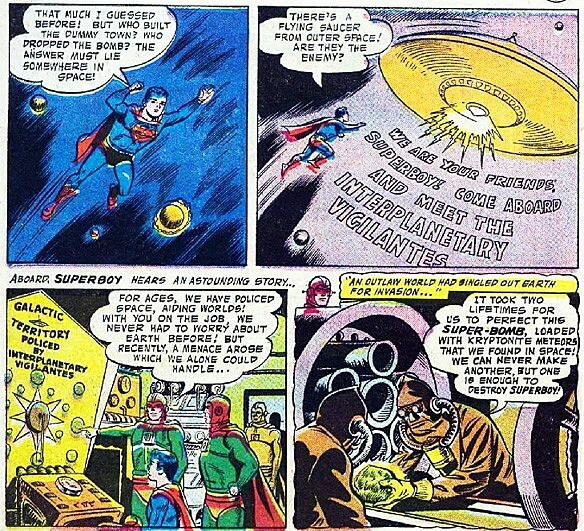 Now, here's what makes this interesting: Less than a year later in Adventure Comics #247, Superboy would get a visit from another bunch of outer-space do-gooders who would decide that the best way to help him out was to pull off elaborate and confusing hoaxes. That, of course, was the Legion of Super-Heroes, who would grow to have one of DC's most dedicated fan-bases. But really, was having them around worth ditching the Interplanetary Vigilantes? I mean, they're vigilantes. They don't even have legal authority; it's cosmic mob justice y'all. How is that not in an ongoing title right now?